I worked in the morning in Hollywood – a sign language interpreter for a deaf actress. She possessed a white hot energy that flowed over everyone like a river of molten lava. I worked in the evening in Watts. I was a sign language interpreter for a caring mother who was beautiful and impossibly honest. Nearly all of the other mothers were Spanish-speaking and had no interpreters. I find the American educational system lacks logic. Today an 80-year-old man was rightly punished for his racism. Today a few people hate Los Angeles a little less. I met my father and brought a six-pack of beer. He had knee surgery and was staying with my Uncle in Redondo. Luckily my Uncle was gone. I owe him $750 and he’s still upset about it. I watched the basketball game and drank most of the beers. My father had one. He said that he was on a lot of medication after his surgery. He asked me a little about my and about my life and about my wife. I asked him a little about Rio de Janeiro where he’s been living. His whole life is a secret. We hugged goodbye and everything was Okay but everything wasn’t okay. I could feel the sadness of father and son. There are some conversations we will never have. There are some experiences we will never share. Everything was okay but everything wasn’t okay but it was okay. I stole a cigarette from my uncle’s wife who was sleeping and smoked a few puffs of it. I saw a sign that pointed to the beach. I saw a beat up pickup truck make a U-turn in the road. Then I put out the cigarette and rolled down the windows all the way. David Bowie was on the radio and they played 4 songs in a row. For some reason they only play good music on the radio late at night. And I cranked those 4 songs and the wind whipped through my hair and I could smell the sea and it was beautiful. And I drove down a street called Torrance Blvd. and up a hill. I saw a flame dancing above a smokestack at an Oil refinery. I thought if hell looks half this beautiful I want to go there. The flame taunted the sky with its mad dance and I madly drove towards it. I continued off course all of the way to the oil refinery and I saw the flame up close and personal. It stank outside – the oily air. And it was a real moment. Me and the air and the flame and the oil refinery and David Bowie. Then I got back on course, found the 110 freeway after passing dozens of taco stands. Late-night taco stands feed the working man and the drinking man of LA. Then there she was. 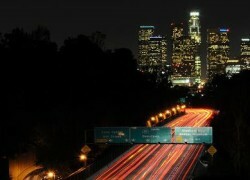 The 110 Freeway. A drunk driver almost ran me off the road. And I swerved past him. They played the last song from Bowie’s Spiders From Mars.